Publish–subscribe is a messaging pattern where senders of messages, called publishers, do not program the messages to be sent directly to specific receivers, called subscribers. Instead, published messages are characterized into classes, without knowledge of what, if any, subscribers there may be. Similarly, subscribers express interest in one or more classes, and only receive messages that are of interest, without knowledge of what, if any, publishers there are. The classes mentioned in this description can also be referred to as topics or filters. ZeroMQ/NetMQ uses multipart messages to convey topic information. Topics are expressed as an array of bytes, though you may use a string and suitable System.Text.Encoding. A message's topic is compared against subscribers' subscription topics using a prefix check. Time for an example. This example is very simple, and follows these rules. 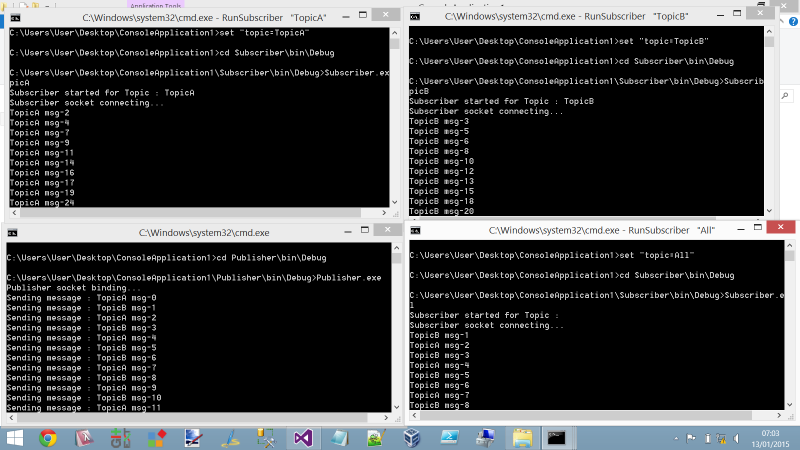 There is one publisher process, who randomly publishes a message to either TopicA or TopicB every 500ms. There may be many subscribers. The topic name is passed as a command line argument. To run this, these three BAT files may be useful, though you will need to change them to suit your code location should you choose to copy this example code into a new set of projects. The SendHighWaterMark/ReceiveHighWaterMark options set the high water mark for the specified socket. The high water mark is a hard limit on the maximum number of outstanding messages NetMQ shall queue in memory for any single peer that the specified socket is communicating with. If this limit has been reached the socket shall enter an exceptional state and depending on the socket type, NetMQ shall take appropriate action such as blocking or dropping sent messages. The default SendHighWaterMark/ReceiveHighWaterMark value is 1000. The value of zero means "no limit".